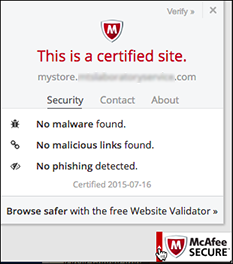 Adding a McAfee Secure Certification Seal to your Online Store can help reassure customers that they can securely shop on your site. This installs a free lite version, which will display the seal to the first 500 visitors to your site each month. The feature is available only in English-speaking countries. 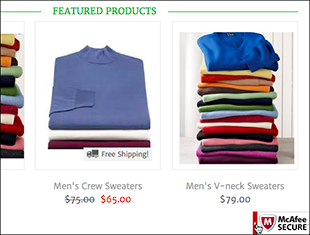 If your store was automatically published at least 90 minutes beforehand, an information bar about McAfee displays below the Online Store menus. Click Learn More to start the sign-up process. Note: The bar displays only after your store has been auto published. If you choose Maybe later in the bar, you can turn on the seal later in the Store Design menu's Site tab by scrolling to the Store Footer section and clicking Learn More. In the McAfee information window, click Sign Up Now to continue. Note: If your store's address ends with mysimplestore.com, simply click Turn On in the McAfee information window and a confirmation will display. You can then skip to Step 7. 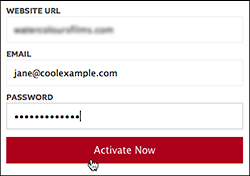 Fill in the form's required fields and click Activate Now, and a new browser window/tab opens, displaying your McAfee account settings. Note: Do not use your GoDaddy password as you're creating a separate McAfee account. McAfee gives you the option of upgrading to a version without the 500 monthly visitors limit. Refresh your browser view of the Online Store's Store Design page. Click the Site tab and scroll down to the Store Footer section where the McAfee Secure Seal should be On. If you want to see how the seal looks to customers, click View Store (or refresh the storefront page if it's already open). The seal is displayed in the bottom-right corner of your store. Note: When customers click the seal, they can see a real-time check of the site's security. 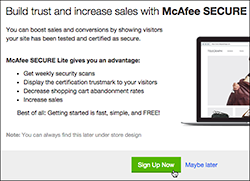 If your store receives more than 500 visitors each month and you're using a custom domain, you can upgrade from McAfee's free Lite version to its paid Pro version any time by returning to the Store Design menu's Site tab and scrolling down to the Store Footer section. Click Manage your McAfee SECURE account to log in to your McAfee account, where you can upgrade.